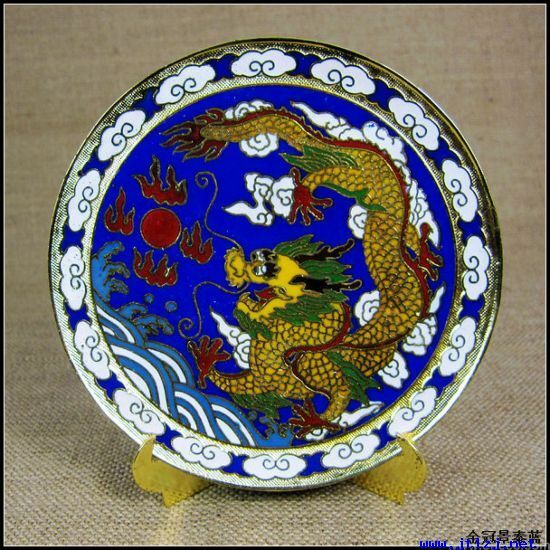 After I published a post containing some Deco-era Chinese beads, a correspondent questioned my analysis of the large disc beads with a dragon and phoenix on opposite sides. 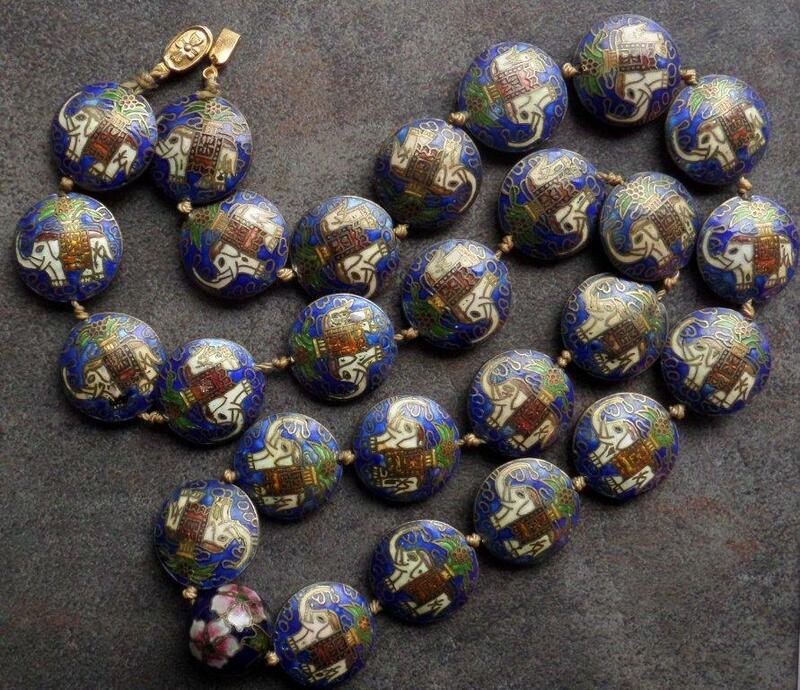 When I had examined these beads with a loupe, it appeared to me that they had an identical pattern that differed from bead to bead only in enamel colors. This exact duplication can only be achieved with a machine; skilled cloisonné wire artists can make copies of a design with remarkable precision, but not to the level achieved by machine stamping. 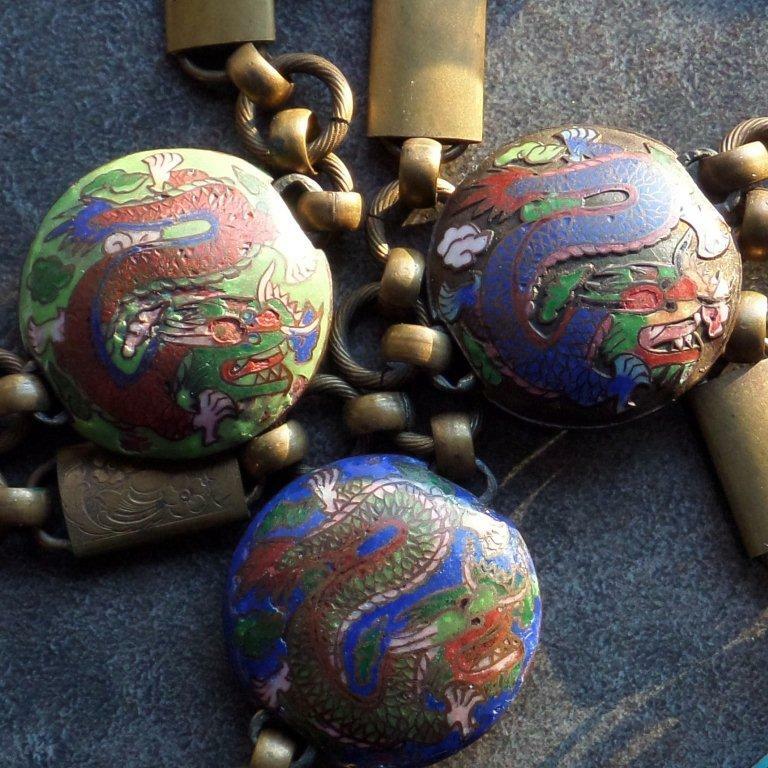 I considered that these identical dragon beads could be thus classified as champlevé rather than cloisonné. However, I had passed my belt of dragon and phoenix beads on to another collector, so was unable to re-examine the beads. Therefore, when this 1930s Blumenthal brooch appeared, I purchased it to take another look at this style of bead. 1) A generalized colloquial term for enamel decoration with different colors applied within separate cells of metal. 2) A specific enamel technique where the separate cells for different colors are formed by thin wires. “Champlevé” refers to the enameling process where the separate cells for the different colors are formed by carving, chemical etching, casting, or die stamping. 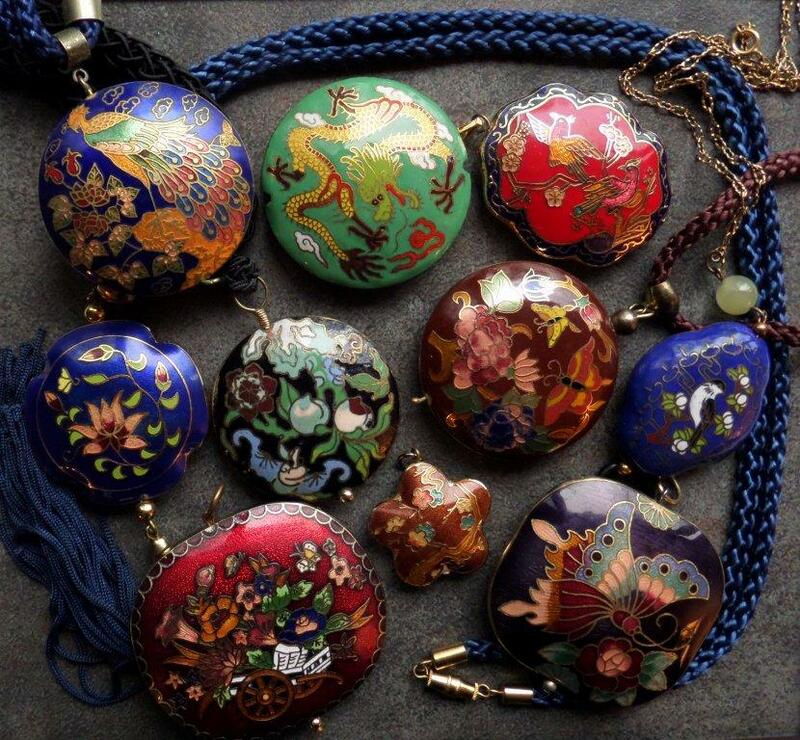 It is not the same technique as cloisonné, in which the cells are formed by wires, although it often gets called “cloisonné” in the general catch-all use of the term. 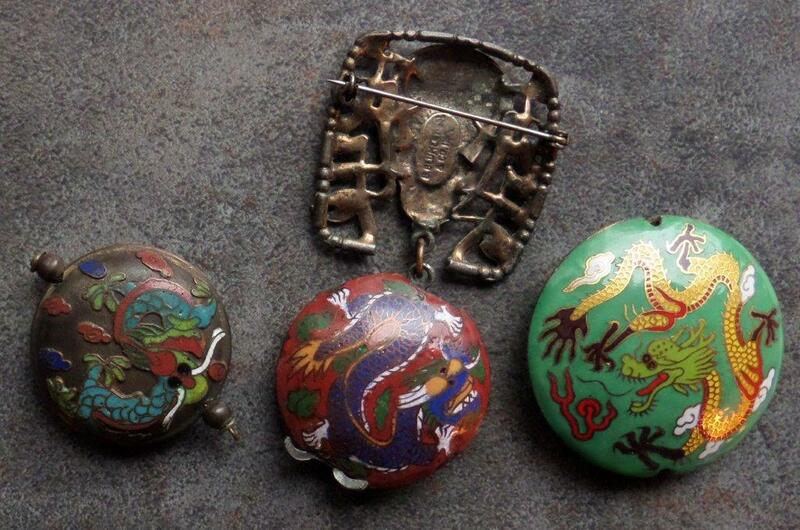 Here’s a great picture courtesy of Ashley Gilreath on the difference between champlevé and wire cloisonné. A Google Image search for “champlevé” produces rich results. Champlevé without the background enamel filled in resembles openwork cloisonné. Openwork wire cloisonné on left, two champlevé pieces on right. Note how the champlevé dragons’ scales look somewhat hexagonal, as if they’d been chiseled, whereas the cloisonné dragon’s scales are semicircular wires. 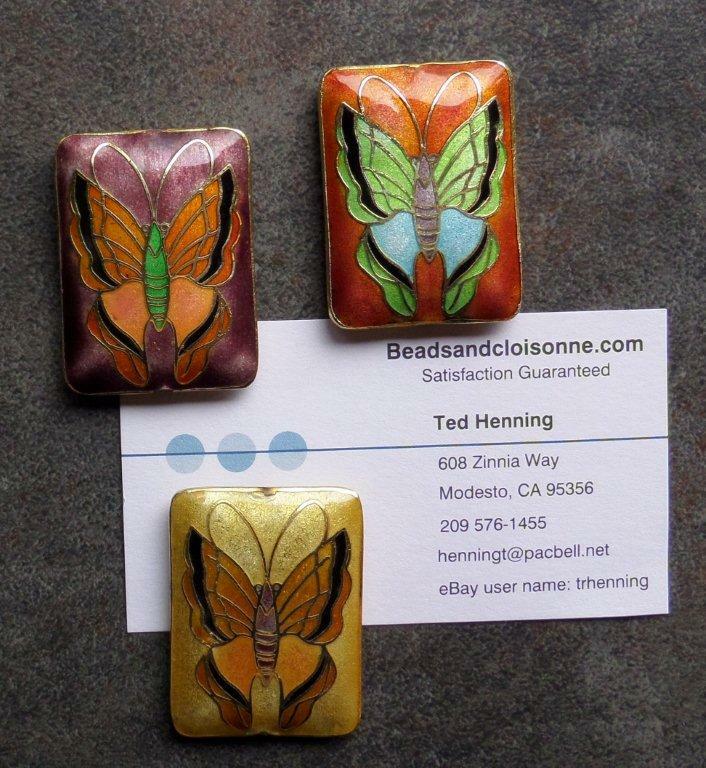 Also compare the openwork cloisonne bead with the openwork champleve bead in the photo at the top of this post. This Patek Phillipe website about cloisonné watch faces tacitly notes in the quote below how wired cloisonné designs cannot be exactly replicated, thus are “individual works of art.” This is in distinction to champlevé, where the design can indeed be replicated with great exactness and detail, thanks to machines. Machinery and modern industrial processes apply splendidly to champlevé, and can turn out products by the million. Epoxy “soft” enamels are commonly used as well as glass enamels. In the following websites and videos, notice not only the massive machinery, but also the amount of human intervention required, from stomping foot pedals and waving blow torches around, to precision carving, enamel application, polishing and electroplating. Try to get past the alarming musical accompaniments. When it comes to champlevé beads, button manufacturers seem to have jumped onto the bus first, most likely due to greater consumer demand and the comparative ease of replicating matched sets of small objects. This ButtonCountry.com page shows various cloisonné and champlevé buttons. The large 1.5-inch rather spiky-looking crane “button” on the right side might actually be a toggle for suspending something from a belt, as a very similar piece is shown in figure 31, page 247, of Margaret Duda’s book Traditional Chinese Toggles, Counterweights and Charms. And can you spot the Inaba cloisonné button? Champlevé beads seem to appear most often in disk shapes, especially larger pieces suitable for pendants, possibly because it’s easier for machines to stamp out two slightly concave pieces that can then be soldered together. A flatter surface also makes it easier for an artist to compose a design without worrying about wrapping it around a sphere and compensating for spherical distortion. Assorted disk beads used as pendants, probably from the 1970s-80s. The bat making a nighttime raid on some peaches is my favorite. Champleve disk beads with a center cloisonne bead, probably c1970s. Champleve dragon and phoenix box available from eBay vendor pinkiesup.